Slovenia is a small country, she told me. You can go from the beach to skiing in less than an hour. Wedged between Italy, Austria, Croatia, and Hungry, it’s a dynamic crossroad for wildly different cultures and culinary traditions. And Ana Ros, chef of the Hiša Franko in Kobarid near the Italian border, is excited by this diversity of her homeland. 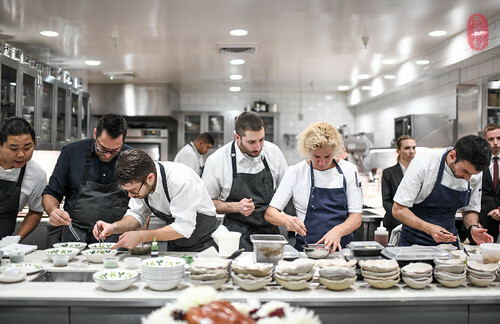 Ros was the tenth guest chef to cook at this year’s Twelve Days of Christmas with hosting chef Christopher Kostow at The Restaurant at Meadowood. There are few chefs I know who can and will hand-make pasta on-the-road at events. Michael Tusk is one of them. He’s the chef and owner of the wildly popular Cotogna and three Michelin-starred restaurant Quince, both in the Jackson Square neighborhood of San Francisco. He’s about to open a cave à vin and specialty food market – Verjus – also nearby. At this year’s Twelve Days of Christmas at The Restaurant at Meadowood, he was the ninth chef to cook with Christopher Kostow. I first attended the Twelve Days of Christmas in 2012. 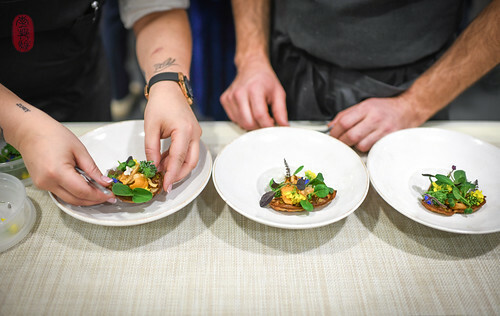 A few months later, in March of 2013, Justin Cogley, chef of Aubergine at the l’Auberge Carmel in Carmel-by-the-Sea, asked me to photograph an event he called Rediscovering Coastal Cuisine. In the years since, I have returned annually to photograph both events. In February of this year (2018), Justin Cogley invited Christopher Kostow to cook at Rediscovering Coastal Cuisine. Also invited to the event was Trevor Moran, formerly the chef at The Catbird Seat in Nashville, Tennessee. To complete the circle among them, and especially for me, who has witnessed and recorded so much of their work apart, Christopher Kostow invited both Cogley and Moran to cook together with him on Day 8 of this year’s Twelve Days of Christmas at The Restaurant at Meadowood. Everything was gigantic in Warsaw. The buildings were gigantic – enormous concrete structures that stretched as far as I could see. Those city blocks were gigantic too. What looked like a short walk on a map, to my surprise, took three or four times as long as I estimated. But amidst all of the grey I found an idyllic patch of green, the famous Łazienki Park (pronounced WHY-zhyen-kee). Formerly the grounds of a complex of royal residences, it is now the city’s largest public park, where wild peacocks scuttle about the tree-lined trails and the city’s hero Frédéric Chopin is breathtakingly immortalized under a windswept willow. I loved Łazienki Park so much that I returned every day that I was in Warsaw in the fall of 2005. It is on the edge of this park that Wojciech Modest Amaro opened his restaurant Atelier Amaro in 2012, which earned a Michelin star a year later. 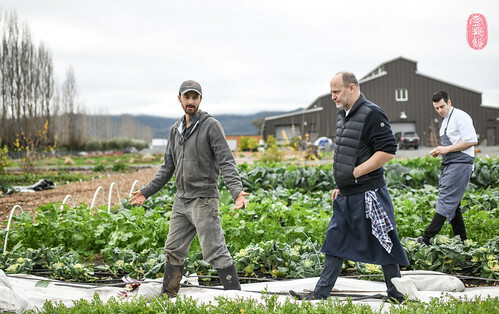 And now, on the eve of moving his restaurant to a new location, chef Amaro traveled to Napa Valley to be the seventh chef to cook with Christopher Kostow at the Twelve Days of Christmas at The Restaurant at Meadowood. 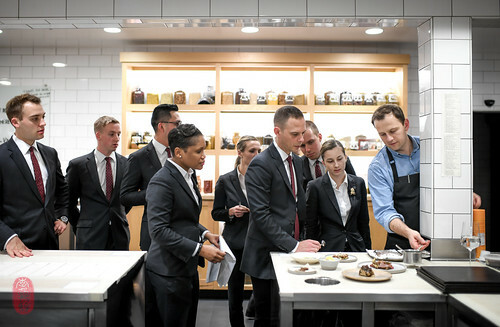 As I have noted many times in the past, one of the best things about the Twelve Days of Christmas is the cultural exchange that happens in the kitchen among visiting chefs and the cooks at The Restaurant at Meadowood. 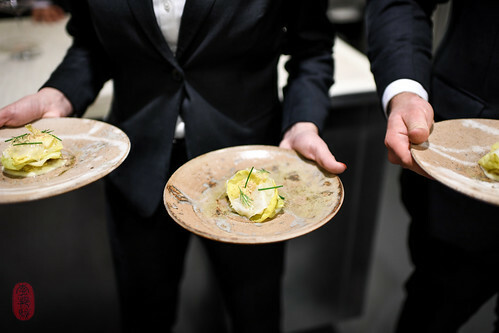 Often working across language barriers – as was the case with Byung-jin Kim, chef of the three Michelin-starred restaurant Gaon in Seoul, South Korea – the high level of coordination and collaboration required by all (both front and back of the house) is a testament to the universality of food, cooking, and hospitality as a language. Arriving from Seoul, along with the restaurateur of Gaon, Lucia Cho, who proved to be an extremely articulate translator and passionate ambassador of Korean culture, Kim was the sixth chef to cook at this year’s Twelve Days of Christmas with hosting chef Christopher Kostow. 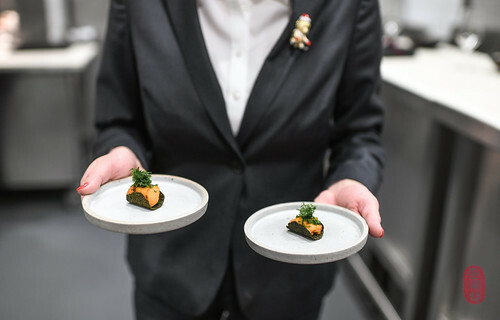 Kamilla Seidler was a name unfamiliar to me until this year’s Twelve Days of Christmas at The Restaurant at Meadowood. Committed to championing social equality, in 2012, this Danish chef moved to La Paz, Bolivia to open a culinary school and restaurant (Gustu) to bring culinary education to an under-developed part of South America. Since, she has received worldwide recognition for her work, which has enabled her to take her initiatives worldwide. She has now returned to her native Denmark to continue her work at home. You can read more about Seidler’s work on her personal website. Seidler was the fifth chef to cook at this year’s Twelve Days of Christmas with host chef Christopher Kostow. In 2011, I met a young, clear-minded chef in Paris named James Lowe. At the time, he was the head chef of St. John Bread & Wine in London. He would subsequently help found the Young Turks, a collaboration with fellow young guns Ben Greeno (who subsequently went on to open momofuku Seiobo in Sydney, Australia) and Isaac McHale (who now runs Clove Club in London, and who also cooked at the Twelve Days of Christmas in 2015). 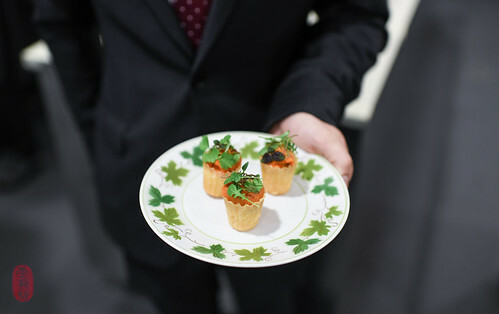 Together, they made a name for themselves for their fresh and affordable approach to British cooking at pop-ups around the city, and later at Ten Bells, just a few doors down from St. John Bread & Wine at Spitalfields. In 2014, Lowe moved on to open his own restaurant, Lyle’s, just up the road in Shoreditch. I was able to visit Lyle’s at the top of 2016, a few months after the restaurant was awarded its first Michelin star. With all of this familiarity with Lowe from far, I was extremely excited to see him on this year’s list of guest chefs for The Twelve days of Christmas at The Restaurant at Meadowood. He cooked on the fourth night.